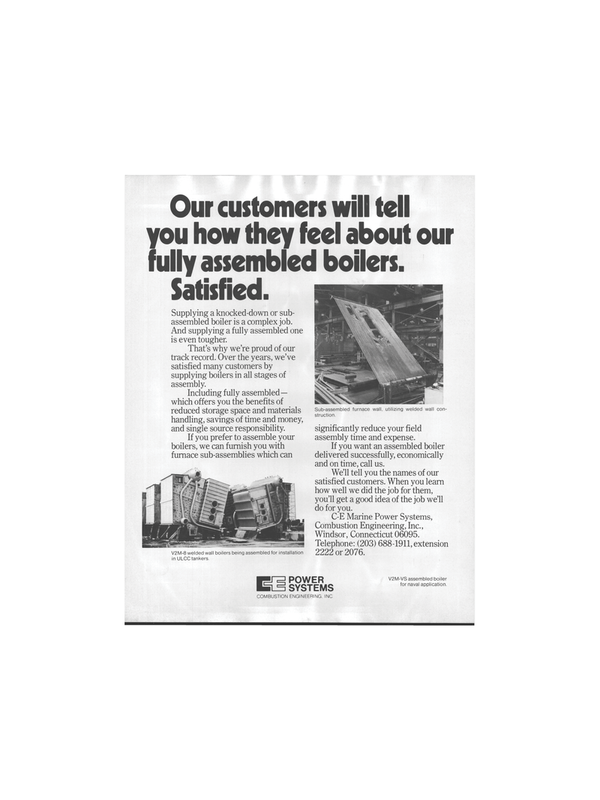 Our customers will tell you how they feel about our fully assembled boilers. Sub-assembled furnace wall, utilizing welded wall con- struction. significantly reduce your field assembly time and expense. If you want an assembled boiler delivered successfully, economically and on time, call us. We'll tell you the names of our satisfied customers. When you learn how well we did the job for them, you'll get a good idea of the job we'll do for you. Telephone: (203) 688-1911, extension 2222 or 2076. Supplying a knocked-down or sub- assembled boiler is a complex job. And supplying a fully assembled one is even tougher. That's why we're proud of our track record. Over the years, we've satisfied many customers by supplying boilers in all stages of assembly. Including fully assembled— which offers you the benefits of reduced storage space and materials handling, savings of time and money, and single source responsibility. V2M-8 welded wall boilers being assembled for installation in ULCC tankers.